Jean Harlow, Hollywood’s original Blond Bombshell, was born 107 years ago today. Happy 106th Birthday, Jean Harlow! Harlow, the daughter of a dentist and his wife, left home at 16 to marry Charles McGrew, a businessman seven years her senior. The pair moved to Los Angeles, where Harlow was soon garnering assignments as an extra in pictures. Her marriage to McGrew ended after just two years, allowing Harlow to focus on her career. She soon graduated from extra work to bit parts in features and shorts. Harlow’s big break came in 1930 when she was cast in Howard Hughes‘ World War I epic, Hell’s Angels. The picture’s premiere at Grauman’s Chinese Theatre in Hollywood was reported to have drawn a crowd of 50,000 people. Hughes sold Harlow’s contract to MGM, where her star continued to ascend. Her work in Frank Capra‘s Platinum Blonde (1931) was very well received, and the following year she was paired with Clark Gable in John Ford‘s Red Dust, the second of six pictures she and Gable would appear in together during her short career. Harlow is said to have turned down lead role in Freaks (1932) and King Kong (1933). Harlow served as godmother to Millicent Siegel, the daughter of gangster Benjamin “Bugsy” Siegel. She also dated mobster Abner “Longie” Zwillman, who advanced her career by loaning Harry Cohn, the head of Columbia Pictures, $500,000. In 1935, Harlow demanded more money from MGM, refusing to work until they assented, and while she was on strike, she wrote a novel, Today Is Tonight. It wasn’t published until 1965, early thirty years after her death. Both Harlow and Marilyn Monroe starred opposite Gable in their final pictures—Harlow in Saratoga (1937) and Monroe in The Misfits (1961). Monroe idolized Harlow and refused the chance to play her in a biopic because she felt the script was not respectful to Harlow. At the time of her death, Harlow was engaged to actor William Powell (and had been for two years). Had the pair married, Powell would have been Harlow’s fourth husband. Though rumors long persisted that her mother, a Christian Scientist, refused medical care for her daughter, or that Harlow died of alcohol abuse, sunstroke, poisoning due to her platinum hair dye or any of a number of other causes, Harlow’s passing, at the young age of 26, came as a result of kidney failure. 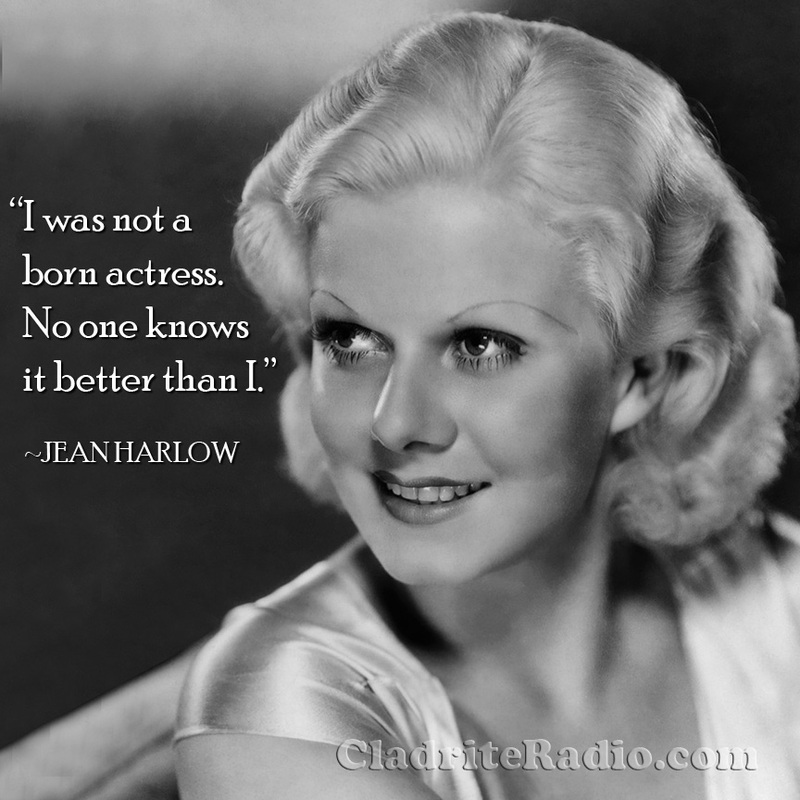 Happy birthday, Jean Harlow, wherever you may be!